Every year we take a family vacation to Panama City Beach, FL for Fall Break. Our schools are on a year round schedule so our summers are shorter, we go to school earlier, but we get more breaks during the year. It has been this way since I have been in high school. This year was different though although the break was moved back to September, we were worried about Hurricane Irma the entire week before. Anyways, we go with my husband's entire family. We decided a few years ago that we each need to get our own condos (at The Summit found through vrbo.com) in the same building instead of sharing one huge condo. That way each individual family can have their own space or do their own thing while we still get to spend time together. This was the best year for my family. And I want to share why I think it was the best so far. We were out at the beach about 9:15 a.m. every day. My kids wake up about 7:30 a.m. on non-school days. We have a schedule at home, but on vacation we try to stick to our little routines since the time can be a little off. Getting out to the beach early made where I didn't feel like I had no time at the beach when we went in for lunch. My husband and I were usually the first ones out there each day and were usually the only ones out there for about an hour. Which was okay with us. And by the time we went in for lunch, everyone was hungry, it was time for a rest, and I felt like I got a decent amount of beach time in. If you follow me on SnapChat, then you saw me sporting my new favorite hat from AmiClubWear. I wish I had it for the cruise. I burn so easy so having shade in the sun is a top priority combined with limiting time in the between 12-2. I stay in with the kids during nap time. My husband usually went back out to the beach with SweetPea after lunch since she doesn't really take naps anymore (some days she still took a nap, we played it by ear). My husband cooks us breakfast and prepares lunch on vacation, I do all the cleaning on vacation. Because we stay in a condo with no room service, I basically just do the laundry (I love having a washer and dryer on vacation because you have no dirty clothes when you return) and wash the dishes although they had a dishwasher. So pretty easy, peasy and I don't have to cook. We help each other because it is both of our vacations. Although my husband has a more traditional job that actually pays our bills, I still bring in an income, but even if I didn't - taking care of the kids all day IS a job in itself of which I use to get paid very well for. When we first started going on vacations, it was a lot of work. We had issues and kinks in the system, but my husband has learned to be way more hands on since the birth of my son. Plus our kids are getting a little older so things are getting easier. Another thing that worked for everyone was separating and doing our own thing. We spent the mornings at the beach together almost every day. One day my mother-in-law went shopping and another day my brother-in-law went fishing, but besides that the morning beach time was our family together time. But as far as dinner goes, I think we ate all together one time. And that was fine. 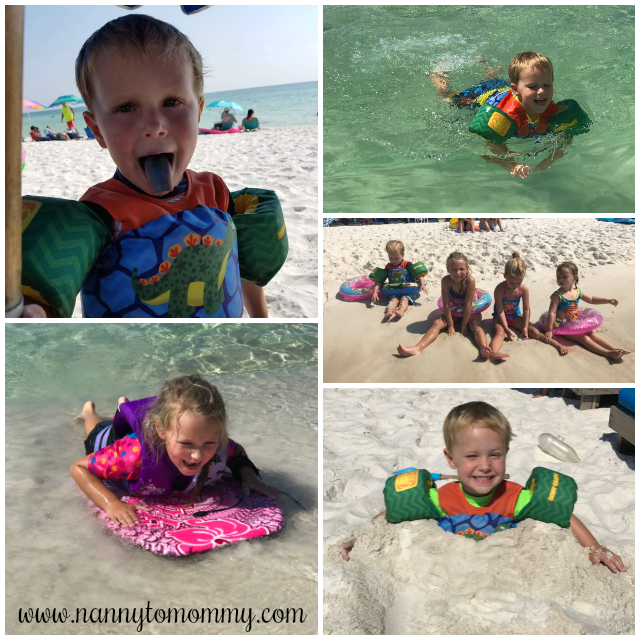 Not everyone in our group likes seafood, a few nights we wanted to stay close by so we didn't have to drive, and then a few nights we went and enjoyed activities the kids would enjoy and not everyone in our group has kids. We had fun with each other and with our little families. 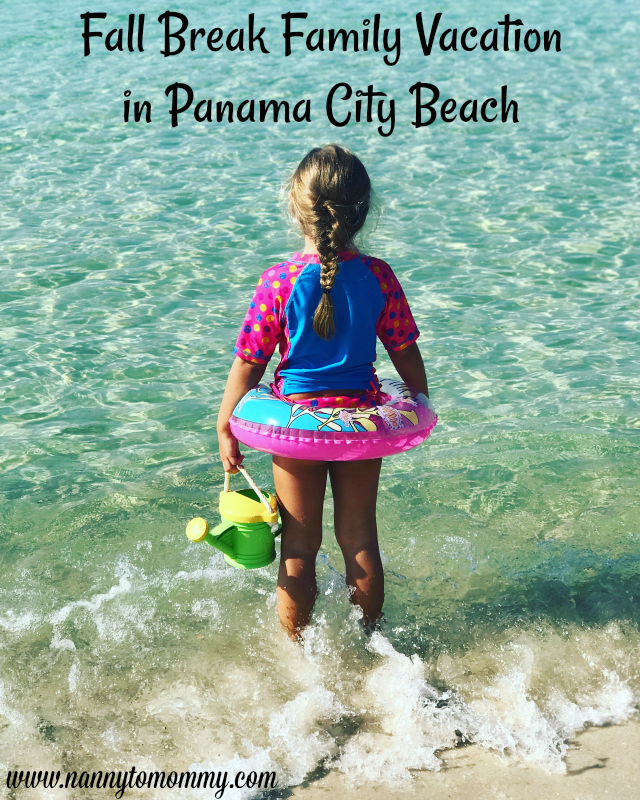 There is a ton of stuff to do in Panama City Beach, Florida. We went go-karting, through a maze, and even played mini golf at Race City. We also want to try Wonder Works next year. We went by there because it rained and thought we would check it out. We, unfortunately, didn't have enough time, but it looked so cool. We also ate a ton of yummy food. 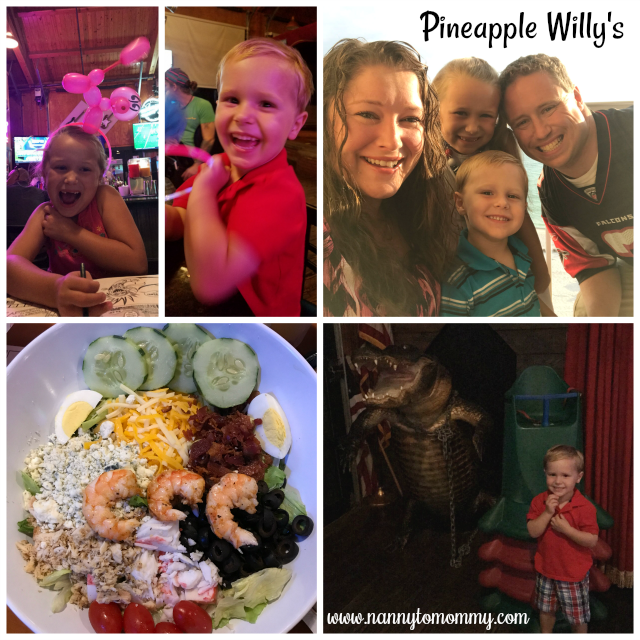 We went to Pineapple Willy's two nights in a row because, ya know - football, but I told Hubby we weren't doing that again. I love eating there, but there are too many other places. I did get to try Red Fish and Seafood Salad for the first time there. 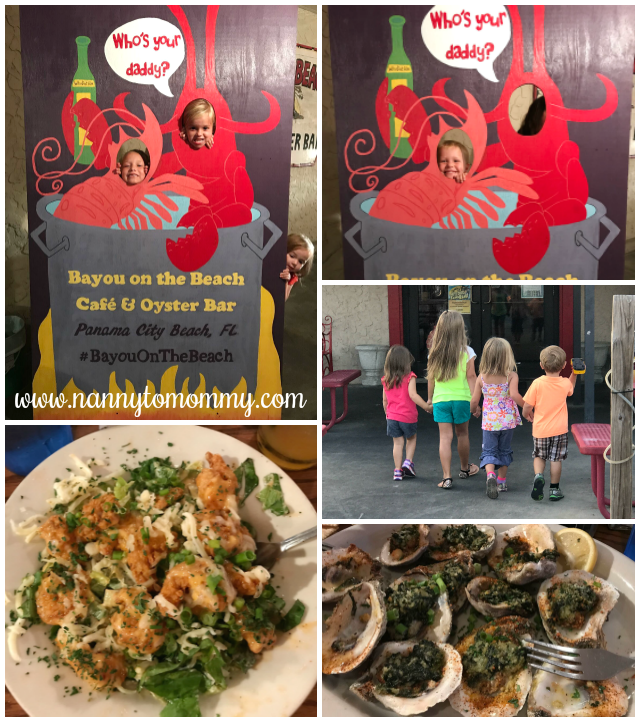 We also went to Angelo's for the best steak ever, ate Tuna Ahi with Cucumber Wasabi Dressing at Salty Sue's, and Oysters Rockefeller with a Who Dat Shrimp Salad at Bayou on the Beach. One day we walked and had Mexican for dinner. Another night we walked and ate the best pizza and to eat ice cream from the Hershey's Bar. Although I think my son thought the coolest part of his vacation was getting ice cream from an ice cream boat at the beach. You can check out our family's traveling adventures on Instagram and SnapChat. 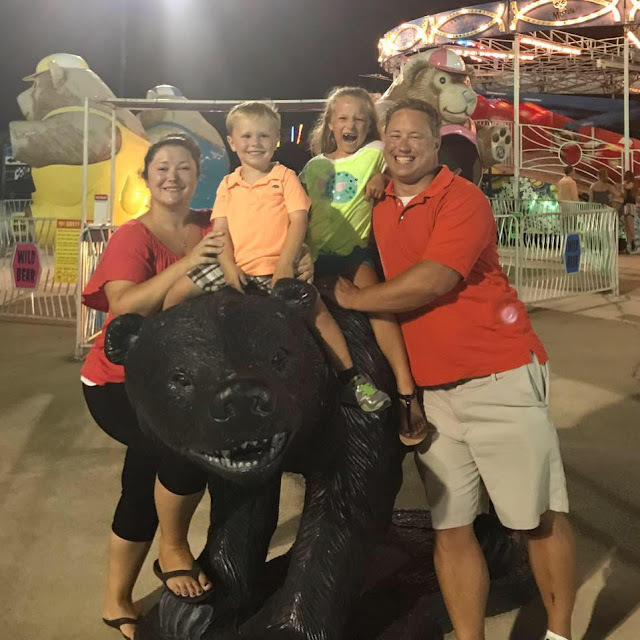 What are some tips you have for making a family vacation a great one? My family would love to visit here one day. I've been to Miami, Fort Lauderdale and Orlando, but never PCB. Thanks for the great information!